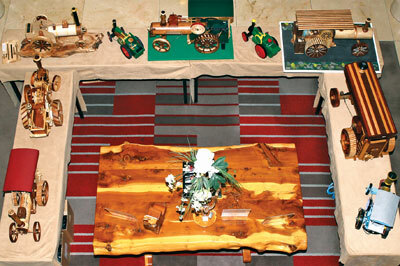 The Irish Woodturners’ Guild - IWG - was founded in 1983 making it the oldest such organisation in the world. In 1980 Liam O’Neill and Ciaran Forbes had attended the International Woodturning Seminar at the John Makepeace School for Craftsmen in Wood at Parnham House, Dorset, England. At this event they met David Ellsworth, Bob Stockdale, Stephen Hogbin, Ray Key and Richard Raffan. Inspired, Liam O’Neill decided to put on a similar event in Ireland, which he achieved in 1982 with Ray Key and Phil Reardon supporting him as the main demonstrators. This, in turn, led to Liam O’Neill, Ciaran Forbes, Jim Foley, Willie Stedmond and others forming the Irish Woodturners’ Guild in 1983. The idea was to set up a national, non-profit-making organisation dedicated to the advancement and promotion of woodturning and within a year there were upwards of 100 members representing almost every county in Ireland. The IWG was open to turners of all abilities from hobbyist to professional and from the outset it was an all-Ireland body. The Guild’s first seminar was held at Shannon, County Clare, in September 1983 with Ray Key, Michael and Liz O’Donnell and Richard Raffan as the guest demonstrators. Its success gave the then committee of the IWG the confidence to press ahead with more ambitious plans, which included having an annual seminar. At the 1984 event David Ellsworth joined Michael and Liz O’Donnell and a great number of talented Irish turners. It was David Ellsworth’s experience of these early woodturning seminars that inspired him to set up the American Association of Woodturners in 1986 and the following year Ray Key established the Association of Woodturners of Great Britain. In 1985, regional seminars were organised and this eventually led to the formation of local ‘Chapters’, a structure that still exists within the IWG. Members join the Guild and a proportion of the membership fee is returned to their ‘home’ Chapter to assist in its running costs. This is one of the main strengths of the IWG with a strong, open-minded, national organisation providing guidance and support for the local Chapters. The first Chapter of the IWG was set up in Dublin in 1990 and it this group that adopted the title ‘Chapter’ rather than ‘branch’ or ‘club’, following the lead of the American Association of Woodturners. The aim of the Chapters was to build on the woodturning skills of their members and to provide a local forum for the interchange of ideas. This process continues today and there are now some 20 Chapters across Ireland. 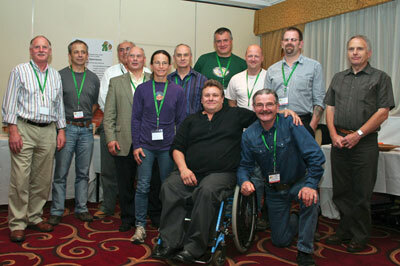 A new Chapter can be established by 10 members of the IWG applying to the National Executive Committee. Following its approval, the new Chapter will get a formation grant from the IWG and set up a committee to organise the activities of the Chapter. Most Chapters hold a monthly meeting, which usually takes the form of a demonstration by one of their own members or by a turner from outside the Chapter, sometimes even from outside Ireland. The Crossborder Chapter was formed in 2007 with about 40 members, although this susequently fell back to the current figure of about 30 members. Early meetings were held in the woodwork room of Beechill College in Monaghan but during redevelopment at the school the Chapter was obliged to find an alternative venue. A number of suitable locations were identified. The Community Centre in Ballinode, a village just a few miles from Monaghan, proved to be the best option. Here the Chapter has the use of either a room – seating about 25 at a demo – or the main hall for larger numbers. The Chapter normally meets on a Saturday afternoon but can use the premises for the whole day when the need arises. The Crossborber Chapter is relatively small and as a result it makes good use of its own members to demonstrate turning projects. However, whenever the opportunity emerges, it will have a full-day demo with visiting international demonstrators. Although less typical of the Chapter structure, a good example of a larger grouping is the Ulster Chapter set up in 1992 and now based at the Woodshed in Templepatrick, County Antrim. It was established following the placing of an advertisement in a local paper announcing the intention to form a local Chapter of the IWG in Northern Ireland and inviting those interested to attend a meeting. Some 70 members attended and, to this day, the Ulster Chapter has remained one of the biggest Chapters of the IWG. The normal meeting for the Chapter is 2pm to 5pm on the second Saturday of each month. There is a competition on two levels each month. 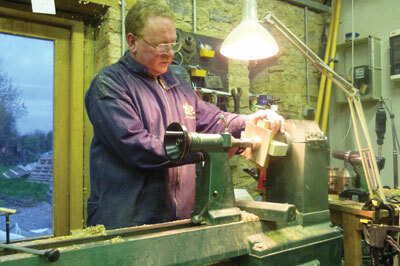 Over the years the competition has helped to bring many good amateur woodturners to a higher skill level. The Chapter has, since 2010, adopted the Play Department at the Royal Hospital for Sick Children, Belfast, as its charity producing close to 1,000 pieces of work each year. Christmas trees, snowmen, eggs, chicks and small figures are all made for the children to paint and decorate themselves. There are also some smaller items in ‘safe woods’ for the ‘Treasure Baskets’ used by the very young patients and their teachers. 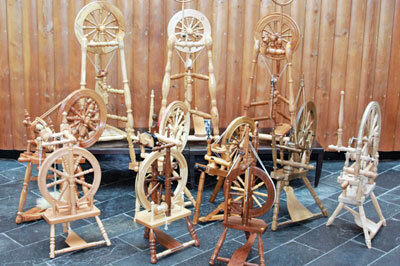 The Chapter is also working on establishing a twinning arrangement with Border Woodturners in Carlisle, England. Given that Sam and Lynda Moore, proprietors of the Woodshed, host a demonstration every Tuesday night using local demonstrators the Ulster Chapter are forced to look further afield for their demonstrators. The majority of these come from across Ireland but three or four times a year the demonstrator will come from the UK which means that the demonstration will be an all-day affair. Occasionally the Chapter secretary Peter Lyons will get the opportunity to bring a demonstrator from further afield, such as the USA or continental Europe. In such events, an Irish tour will be organised for the demonstrators to visit as many Chapters as possible in the time available. This has the combined effect of lowering the overall cost to the Ulster Chapter while simultaneously helping the smaller Chapters which benefit from being able to meet demonstrators who they could not afford to bring in on their own. Recently, encouraged by several members, the Ulster Chapter invited Yann Marot from France to visit Ireland to do a series of masterclasses and demonstrations. This was a very successful event and Yann spent a very productive two weeks in the country, one of them in the Dublin area and the second with the Ulster Chapter. All of the Masterclasses were fully booked and Yann also did the Tuesday-night demonstration for the Woodshed as well as a whole day for the Chapter on the Saturday. It is hoped that success of this venture will encourage more demonstrators to Ireland in the future. Soon after the founding of the Guild it became clear to those on the Committee that they needed to keep in touch with woodturners around the country and in 1983 Joe O’Neill initiated the monthly newsletter. Michael Dickson, the then secretary of the IWG, took on the newsletter’s production. Initially this took the form of a single sheet printed on both sides but by the early 1990s it was several pages long. In the spring of 1993 the Dublin Chapter’s Garth May produced the first Dublin Chapter Journal. Within a year David Sweeney introduced the magazine and in 1995 the Dublin Chapter undertook the task of producing The Journal for the whole IWG membership. A year later the National Executive Committee took on the task appointing a Journal Editor to the Committee. Through the stewardship of Peter Mulvaney, Hanspeter Bodmer, Peter Lyons and now Rich Varney The Journal has become a professional 64-page, full-colour, quarterly magazine considered to be among the best of its kind. The Journal echoes the workings of the IWG and devotes 50% of its space to reports from the all the Chapters around the country. This approach helps the Chapters to learn from what other Chapters are doing and also encourages them to improve their offerings to their own members. During his time as Editor, Peter put out an appeal to try to get a full set of copies of the Journal from the beginning. Paddy O’Connor came forward with a full set, in a carrying case! This was given to the National Library of Ireland and it is kept up to date as each new issue of the magazine is added. A separate set was compiled from many sources and this travels with the post of the Journal Editor. 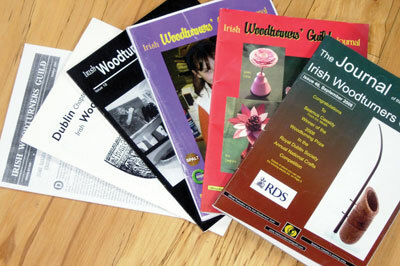 The first woodturning seminar was held in Ireland in 1982, the year before the foundation of the Irish Woodturners’ Guild. 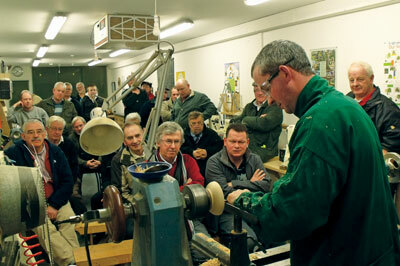 This event was organised by Liam O’Neill and others who had no idea how many, if any, woodturners would attend. 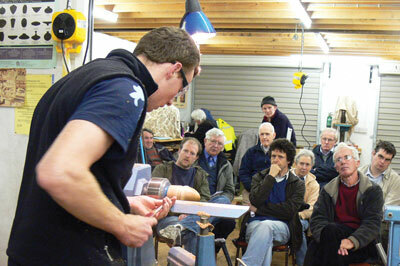 This event was essentially a two-day upskilling course supported by Craft Supplies (UK) whose then instructor Phil Reardon taught basic skills while Ray Key demonstrated more advanced techniques. In 1983, the first annual seminar organised by the newly formed IWG was held and hosted a great number of delegates due to the efforts of members. The seminars for 1984-1986 were held in Letterfrack, County Galway, and saw the introduction of prizes for the best pieces in a number of categories. This awarding of prizes for the best work at the seminar is still a major feature of IWG seminars. The events are organised by the National Executive Committee and hosted by a local Chapter. The local Chapter does the research on the ground for suitable venues and submits a proposal to the National Executive Committee. The local Chapter also provides much of the equipment required and the stewarding during the event. Until 2008 the demonstrations were held in a school, during the October half-term break, with a local hotel providing meals and accommodation. A feature of each of the early seminars was the inclusion of a well-known American woodturner plus at least one from the UK. By the mid-1990s the number of UK demonstrators at each seminar had increased and often a European turner was included. By 2000, American, European and UK demonstrators were a feature of each seminar. At this time the seminar was still a two-day event. As 2008 approached – the year of the 25th Annual seminar – the National Executive Committee at the time wanted to do something special to mark the occasion. It was agreed that the anniversary seminar would be a three-day event; have as many as possible of the original demonstrators from the 1983 seminar; and be held under one roof. The 24th seminar had been hosted in Ballina, County Mayo, by the Craobh Eo Chapter and it gallantly agreed to host the 25th seminar having found a suitable hotel in Enniscrone only a few miles from Ballina. This seminar had almost double the usual number of demonstrators and was deemed to be a great success. The years since have seen the ‘all-under-one-roof’ and the three-day format retained. The National Executive Committee is committed to constantly improving the seminar for the benefit of the delegates who come from all over Ireland, the UK, the USA and Europe. It is remarkable that hotels are willing to cope with the mess that woodturners make though the area around each lathe is covered with plastic sheeting. The 2008 seminar saw the introduction of the annual Chapter Challenge. The first Challenge was to fit as many boxes as possible – Russian doll-style – within a given size. Challenges since then have included the lightest plate of apples – the size was fixed – a breakfast tray, a spinning wheel, a model traction engine and, most recently, a bicycle, as featured in last month’s issue of Woodturning magazine. The National Executive Committee members are elected annually at the AGM with the exception of the President who serves a four-year fixed term of office. Office bearers may serve a maximum of five years. This is meant to revitalise the National Executive Committee but in reality it can be difficult to get volunteers to serve on the Committee and officers often remain on the Committee albeit in a different role. Since 1983 the Seminar has been an item on the agenda for every National Executive Committee meeting and not just the upcoming Seminar but also looking ahead to future events. One problem that has tested the National Executive Committee over recent years is the thorny issue of insurance. The insurance for all the activities of the Guild including Chapters is arranged centrally and as woodturning has developed over the years it has become increasingly important to get the correct cover for the activities of the Guild. The National Executive Committee spends quite a lot of time discussing how the Chapters are meeting the aims of the IWG in what they offer their members. As mentioned above, the quarterly Chapter reports in The Journal give a good outline of what is going on around the country but there are, and always will be, variations in what Chapters are able to offer to their membership, especially those who meet on mid-week evenings. The National Executive Committee tries to support all Chapters through grants towards the purchase of new equipment, towards bringing demonstrators from outside the immediate area and towards running local one-day seminars. Membership of the IWG has fluctuated over the years, from a low of about 700 to more than 800. Having seen falling numbers for the past few years, however, the figures are beginning to climb again. It is the intention of the National Executive Committee to continue to promote the IWG and to increase membership as this is currently the only source of income. Encouraged by the Design and Craft Council of Ireland several members of the National Executive Committee have participated in a ‘Business to Arts’ programme and it is hoped that this will lead to sourcing other funding streams which will be used to set up training programmes for tutors, demonstrators and members.